Nizoral anti-dandruff shampoo treats and prevents dandruff and its symptoms such as dry, flaky, red, itchy scalp. Nizoral is a light pink, perfume-free shampoo for the treatment of dandruff, seborrhoeic dermatitis and other scalp conditions that are caused by fungi. 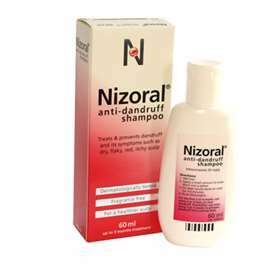 Nizoral contains the antifungal ketoconazole which is used primarily to control dandruff and seborrhoeic dermatitis. It kills the fungi that cause the flaking and itching associated with such conditions. Ketoconazole can also be used to treat Pityriasis Versicolor, a fungal infection of the skin. Directions: wash the affected areas with Nizoral shampoo and leave for 3-5 minutes before rinsing. For the first 2-4 weeks, use twice weekly to clear dandruff. Thereafter, use every 1-2 weeks to prevent the dandruff from coming back. Keep Nizoral away from the eyes. If Nizoral gets into the eyes, rinse thoroughly with water. If symptoms have not improved with 4 weeks' use, consult your doctor. Note that Nizoral is not a treatment for hair loss. Nizoral is suitable for adults and children. Nizoral is dermatologically-tested and fragrance-free. Active ingredient: Ketoconazole 2% w/w. Inactive ingredients: Sodium lauryl ether sulphate, Disodium monolauryl ether sulphosuccinate, Coconut fatty acid diethanolamide, Laurdimonium hydrolysed animal collagen, Macrogol 120 methyl glucose dioleate, Sodium chloride, Concentrated hydrochloric acid, Imidurea, Sodium hydroxide, Erythrosine sodium (E127), Purified water. For a larger bottle size, try Nizoral 100ml.